Role playing the characters in Alice in Wonderland. The Mad Hatters Tea Party. Using foundations of art therapy in drama. This picture I drew immediately after acting in the scene. 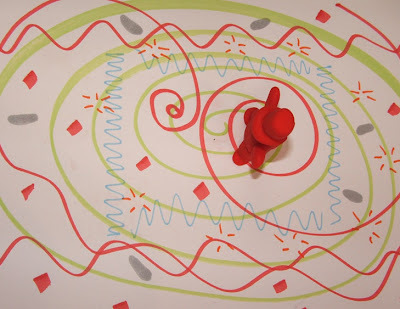 The red plasticine figure the Mad Hatter wearing a top hat standing in the middle of the table taking centre stage.